Benefitting: Wheeler Mission | Outreach Inc.
Homelessness knows no season! On any given night, there are over 1,600 homeless men, women, youth, and children right here in central Indiana. These are our neighbors. They are classmates of our kids. They are people who need our help. Outreach and Wheeler Mission serve hundreds of homeless people every night of the year. Wheeler Mission helps the homeless and needy in Indiana. Founded in 1893, Wheeler is the oldest continuously operating ministry of its kind in the state of Indiana. Their mission is to provide Christ-centered programs and services for the homeless and those in need. Their vision is to see every man, woman, and child we serve equipped to be productive citizens who enjoy lasting success in Christ. Outreach is a faith-based nonprofit organization in Indianapolis, Indiana, that reaches out to homeless young men and women (ages 14-24) with the compassion of Jesus Christ. Their goal is to equip and empower these at-risk young people to achieve stability and life transformation. They believe in the redemptive power of Christ to help homeless youth find a home by offering them the hospitality of Christ, journeying with them and encouraging transformational guidance, and instilling in them hope to exit the streets and move toward a stable lifestyle. I'm SO excited to be able to help raise funds for Wheeler Mission this year for Strength in Our Streets! One of the reasons I love CrossFit (especially CrossFit 54!) is because everything relies on the hard work of the individual, but thrives on the bond of community and teamwork - and that's true of things outside our workouts, too! Only five men and five women from CrossFit 54 will be able to go and compete the actual day of the competition. Those five men and five women are decided entirely by donations - not by skill level (thank the good Lord because y'all know I wouldn't be making that cut! ;) ). I've set a super lofty goal for myself to raise $1,000 alone for Wheeler. Donations of all sizes are appreciated and go entirely to Wheeler. I do not benefit financially from your donation, nor does any other individual or CrossFit affiliate. This is all for Wheeler! 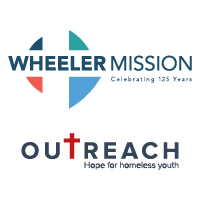 About Wheeler Mission | Outreach Inc.